Formed in 1995, The Badd Dog Blues Society tours steadily, working three to four nights a week from the mountains to the islands and back again. They have toured southeast Alaska from Petersburg to Juneau to Port Protection and all point in between for over ten years. The band travels as a four- to five- piece, drawing from a growing dog pound orchestra of more than 40 top-notch players, spreading the word of the blues throughout the Northwest corner of the lower 48. Tapping the wealth of abundant talent in the Bellingham blues scene, Andy Koch has brought together an up-tempo ensemble sure to please blues lovers everywhere. You’ll be in for an evening to remember as Andy and his band wag their way through the back alleys of the blues – dancing, singing and howling the night away. 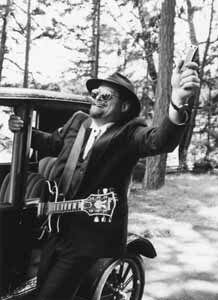 Andy “Badd Dog” Koch sings and plays harmonica and guitar in the band. Musicians have included Rob Smith, Ranger Kidwell Ross, Chester Dennis Jones, Mike Boyce, Jon Parry, Fat James, Johnny “Buffalo” Goodman, Wedge, Tall Paul, Roger McGilvery, Derek “Doc Hamma” Koellmann, Patrick Manuel, and countless others. The Badd Dog Blues Society maintains a Facebook page full of dedicated fans, and publicize themselves heavily. They have built a strong following through professionalism, showmanship and tons of fun! The Badd Dogs welcome the region’s blues musicians who show up, at Andy’s request, and deepen the blue tones in any given set. Andy gathers the strays wherever he goes to make wonderful music with the local greats! Andy and the Badd Dog Blues Society are everything Dr. Blues prescribes for a “real” blues experience. In years past, Andy used to run open mic’s two to three nights a week. Andy has seen the best and the worst musicians in the Northwest come through and play on one stage or another. Brandi Carlile was a featured act, and Paul Rogers (Bad Company) played there too.